Berreto doesn't exhibit an ounce of the free-flowing creativity a film about an artist of Bishop's caliber deserves. An examination of Pulitzer Prize-winning American poet Elizabeth Bishop’s pivotal years spent in Brazil in the 1950’s and ’60s, Reaching For the Moon is an ironically literal, trite, unpoetic biopic that likely wouldn’t have been met with approval by its late subject. 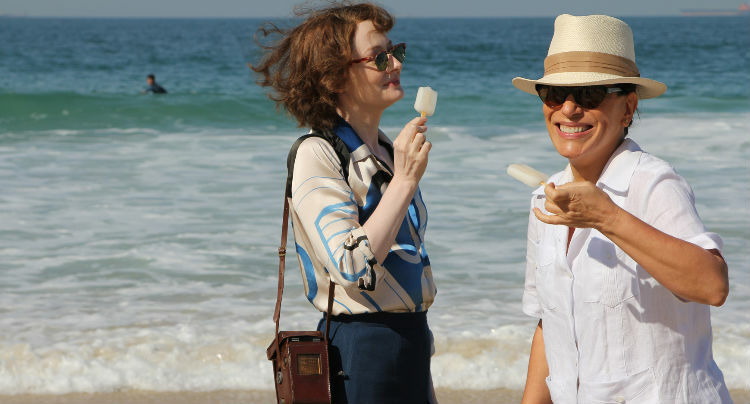 The film revolves around Bishop’s (played here by Miranda Otto) relationship with spirited Brazilian socialite and architect Lota de Macedo Soares (Glória Pires) that turned what was supposed to be a short visit into a stay that lasted 15 years. Director Bruno Barreto seems to be painting-by-numbers here, hitting a bevy of typical biopic plot points with almost parodical laziness, and not exhibiting an ounce of the free-flowing creativity a film about an artist of Bishop’s caliber deserves. Upon arriving in Rio de Janeiro to mine inspiration from the lush, picturesque country, Bishop, a mousy, alcoholic introvert, unhealthily critical of her own work (despite its brilliance), clashes with Soares’ gregarious, in-your-face temperament. Eventually (predictably), their quarrels blossom into a cloyingly melodramatic romance. The mingling of their creative minds, each bringing worlds of wisdom from their respective fields, is interesting on a handful of occasions, and Soares’ paradisal Brazilian home serves as a wondrous backdrop, but their attraction never seems to cross the threshold from flirtation into true passion. They form a volatile domestic arrangement with Mary (Tracy Middendorf), Soares’ jilted ex, who serves as the conniving, antagonistic third wheel of the tale, which leads to soap opera dullness. Otto is uncomfortably stiff (a compliment, as this is what the role calls for) until depression and binge drinking shift her character from awkward shy-girl to sloppy drunk, a shift the actress carries out well. Pires is even better, exuding vivaciousness and charisma, and imposing a domineering masculinity in all of her interactions. 99 out of 100 times, I’d bet these two would share absolutely electric onscreen chemistry, but here, the on-the-nose, forced dialog stifles them at every turn, giving them very few opportunities to exhibit any kind of true intimacy. With the romance the film is built upon being a shaky foundation at best, the only alluring thing left is Barreto’s touristic photography of Rio de Janeiro. A Brazilian himself, Barreto clearly adores the natural beauty of his country, taking care to let us revel in the wondrous surroundings of Soares’ home. Midway through the film, Soares builds Bishop a writing studio with a patio that overlooks the heavenly scenery, and Barreto milks the beauty of it for all its worth. It’s a pretty, pretty setting, but the mediocrity of what’s taking place in the foreground spoils the pot. Disappointingly, Barreto’s film about two exceedingly gifted artists is sorely lacking in artfulness, even being so corny as to utilize voiceover recitations of Bishop’s poetry as a device to make the tired on-screen happenings seem more meaningful than they actually are. As Otto recites “One Art”, a melancholy, heart-wrenching poem by Bishop about “the art of losing”, Barreto shows a little boy’s toy ship sinking in a pond in front of him. Really?